genetics and explores exciting advances in the field. Recently a bill in the Connecticut state congress was proposed requiring Connecticut consumer be made aware of GM foods they are purchasing by placing labels on these items. The bill was killed though by a lower level General Law Committee before it could be voted on. This is currently a large portion of the GM food debate, labeling. Some feel these foods should be labeled so people know what they are eating, while others feel that GM foods have been proven safe enough to the point where labeling is not necessary. Through my research this semester, I have found nothing that suggests GM foods can harm humans, and there is not a single instance where GM foods were tied to any health problems. The truth is, it is nearly impossible to tell if a GM food has affected an adult. Considering the rest of their diet and general lifestyle, there are too many factors to test its direct effect. I don't see labeling of these foods happening in the near future for two reasons. First, several items in the produce section would require labeling, but I would bet that most of packaged foods would require GM labels. Corn which yields corn syrup, sugar beets which make up a large percent of our sugar, and soy are all GM foods, and these items are commonly found in the ingredient lists on nutritional facts. Grocery stores would be covered in GM labels, so it honestly makes more sense to label those things that are organic, which is already done. The consumer should assume they are eating GM food if it isn't organic. Second, large corporations won't let labeling happen. Monsanto, for example, produces most of the GM seeds used in America, and also produces the herbicide that may be used with them. They do not want to see labels on GM foods, as it could hurt their profits. Unfortunately, corporate lobbyists are the most powerful people in Washington, so I doubt federal legislation will come through anytime soon concerning the labeling of GM foods. Your point is a good one--it would be onerous to label everything as GM. At the same time, I don't think the general public knows it's eating GM all the time (or I think we might see more people eating organic, just to be cautious). I'm not sure we can argue GMs aren't harmful, either. The food lobby is incredibly powerful and, as you note, it would be difficult to determine what impact that have, if any. But we do know that foods high in corn syrups and soybean oils, for example, can cause significant problems with inflammation, which has impact on heart disease, immune disorders, and diabetes. Whether this is compounded by GM, I don't know. So it's a big complex problem. But I think if we decide not to label, there needs to be a good public education campaign to go along with that choice. I just wanted to say that I enjoyed reading your blog. Thank you for some great comments on my blog too. Good luck with life. I would think labeling non GM foods would be a good idea, but currently there is very little regulation on what is considered "organic" or "all natural" I believe. These organic foods can still be GM. So if tighter restrictions were put on what can actually be called organic I would be fine with just labeling non GM foods. But as a consumer I feel I have a right to know whether or not it is potentially harmful to me. I am a student of Geological Engineering at the Colorado School of Mines. 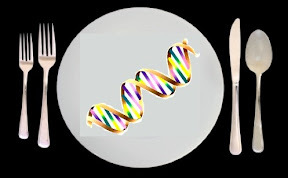 I have great interest in the field of genetics and maintain this blog as part of my Communicating Science class, where we focus on how to clearly and properly communicate the findings of science.